Most of the world's oil and natural gas reserves may be locked up inside the tiny pores comprising shale rock. But current drilling and fracturing methods can't extract this fuel very well, recovering only an estimated 5 percent of oil and 20 percent of gas from shale. That's partly due to a poor understanding of how fluids flow through these small pores, which measure only nanometers across. 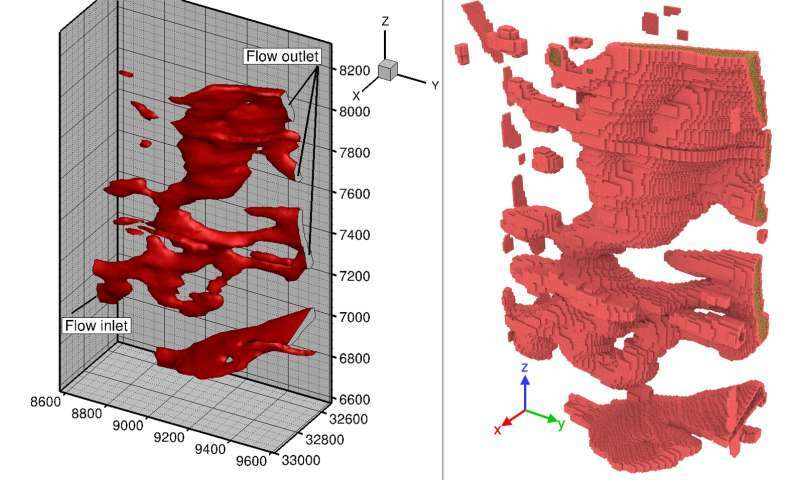 But new computer simulations, described this week in the journal Physics of Fluids, can better probe the underlying physics, potentially leading to more efficient extraction of oil and gas. With more porous rocks like sandstone, where the pores are as big as a few millimeters, oil and gas companies can more easily extract the fuel by injecting water or steam into the ground, forcing out the oil or gas. "Their physical characteristics are well understood," said Yidong Xia, a computational scientist at Idaho National Laboratory. "There are a lot of well-calibrated mathematical models to design the engineering tools for extracting the oil." But that's not the case for shale. "The difficulty is that the pore size is very small, and most of them are scattered—they're isolated," Xia said. "So if you can fill part of the pores with water, there's no way it can move into other pores." Hydraulic fracturing can create cracks that connect those pores, but without a solid understanding of the pore distribution and structure of the shale, oil and gas companies are working blind. To better understand the physics of how fluids like water, oil and gas flow through such tiny pores, researchers have increasingly turned to computer simulations. Yet those too have been limited. When pores are large, fluid moves as a smooth continuum and models can treat it as such. But with nanoscale pores in shale, the fluid acts more like a collection of particles. In principle, a computer can simulate the behavior of every individual molecule that makes up the fluid, Xia said. But that would take too much computing power to be practical. Instead, Xia and his colleagues used what's called a coarse-grain approach. They modeled the fluid as a collection of particles in which each particle represents a cluster of a few molecules. This dramatically cuts down on how much computational muscle is needed. What also sets these new results apart is the incorporation of high-resolution imagery of shale samples. Researchers at the University of Utah used focused ion beam scanning electron microscopy on a piece of Woodford shale a few millimeters in diameter. The ion beam in this method cuts through the sample, scanning each slice to generate a 3-D image of the rock and its detailed pore structure at the nanometer scale. Those images are then fed into the computer model to simulate fluid flow through the scanned nanostructures. "The combination [of microscopy and simulations] is what really produces meaningful results," Xia said. Still, these kinds of simulations alone won't revolutionize shale oil and gas extraction, he said. You would need a broader understanding of the entire structure of the shale, not just small samples. But, he said, you could take multiple samples throughout the shale and run computer simulations to gain more insight into its physics. To be clear, Xia added, they're not endorsing any particular technology or energy source. As researchers, their focus is to simply better understand the basic physics of shale. 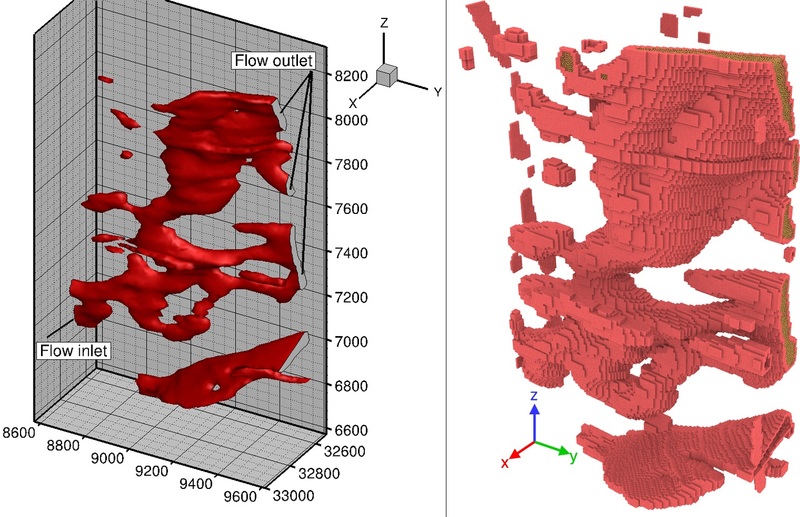 Can we accurately model fluid flow in shale?